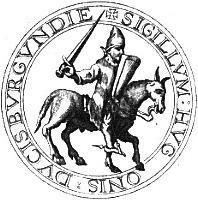 Biography*: Hugh III of Burgundy (1142 – August 25, 1192) was duke of Burgundy between 1162 and 1192. Hugh was the eldest son of duke Odo II and Marie of Champagne, daughter of Theobald and Mathilda of Carinthia. 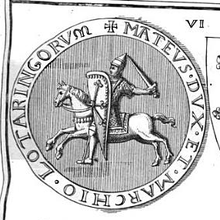 The rule of Hugh III marked the ending of a period of relative peace in the duchy of Burgundy. Hugh was a belligerent man and soon was involved in conflicts against king Louis VII of France over their borders. When King Philip Augustus succeeded Louis in 1180, Hugh seized the opportunity and forced several men to change their allegiance to Burgundy. Philip II was not happy with the loss of his vassals and invaded the duchy, besieging Châtillon. The town fell and with it, its garrison, commanded by Eudes, Hugh's heir. A peace was negotiated and Hugh had to pay a high ransom for his son and give up ambitions over French territory. In 1187, Hugh transferred the capital of Burgundy to Dijon, and endeavoured to turn the city into a major commercial centre. Hugh then turned his energies to the Holy Land, embarking in the Third Crusade in the retinue of Philip II. When Philip returned to France, he left Hugh in charge of the French troops. Hugh played a major role in the victory of the battle of Arsuf (September 7, 1191) and at the siege of Acre, where he died August 1192. [S746] Wikipedia, online http://Wikipedia.com, https://en.wikipedia.org/wiki/Odo_II,_Duke_of_Burgundy. [S746] Wikipedia, online http://Wikipedia.com, https://en.wikipedia.org/wiki/Matthias_I,_Duke_of_Lorraine. 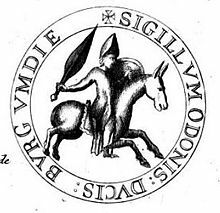 Biography*: Eudes II of Burgundy (1118 – June 27 or September 27, 1162) was Duke of Burgundy between 1143 and 1162. Eudes was the eldest son of duke Hugh II and Felicia-Matilda of Mayenne, daughter of Gauthier, Count of Mayenne and Adelina de Presles. He married Marie de Champagne, daughter of Theobald II, Count of Champagne and Matilda of Carinthia. [S922] David Malcolm, Genealogical Memoir of the House of Drummond, page 14. [S922] David Malcolm, Genealogical Memoir of the House of Drummond, page 8. [S1004] 1921 Canada Census,Tompkins # 9765. [S1020] Walker 9768 - Beaton 9770 Marriage. [S1019] Flora Ann Walker, Nova Scotia Vital Statistics Book 1904, Page 69901662 (1904). [S1018] Donald James MacFarlane Border Crossing Card (3 Sept 1925), Meredith, Belknap, New Hampshire, USA. [S1021] Unknown repository Declaration of Intent to Naturalize, 232190 (March 26, 1931), unknown repository address. [S1047] 1891 Canada Census, Basker # 3890.